As Aly Raisman, captain of both the gold medal-winning 2012 and 2016 U.S. women’s Olympic gymnastics team, said Friday, speaking to Nassar from the lectern, “Your abuse started 30 years ago, but that’s just the first reported incident we know of. If over these many years, just one adult listened and had the courage and character to act, this tragedy could have been avoided. I and so many others would never, ever [have] met you. “Larry, you should have been locked up a long, long time ago. The fact is, we have no idea how many people you victimized, or what was done, or not done, that allowed you to keep doing it, and to get away with it for so long. My very first job out of journalism school involved, among other things, checking in each morning at 6 a.m. at the maximum-security prison in Jackson, Michigan, to see what had happened to who overnight. Nassar is going to be behind bars, and for a long time. What happens to him in the Michigan prison system — be assured he will get a full measure of justice. Raisman’s remarks, meantime, make for the starting point — after each and every survivor has had the chance in that Michigan courtroom resuming this week to take to the microphone — for what should come next, three separate but related paths. 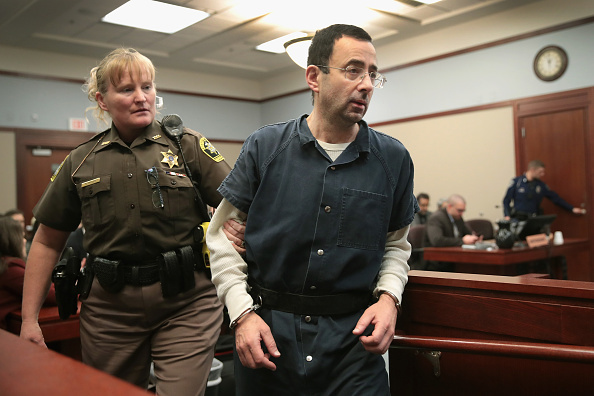 One, every resource should be made available to each and all the girls and young women — now more than 100 — whom prosecutors have accused Nassar of abusing. How many girls and young women complained? To whom? When? How many complaints got acted upon? In what manner? How many dismissed? How? Why? Broadly and then specifically, who failed these girls and young women? How? When? Why? The grown-ups need to be held accountable for what happened to the children. The abuse that Nassar perpetrated is criminal conduct. In the Olympic context, an organization, USA Gymnastics, seemingly turned a blind eye or facilitated that conduct — which? The federation's longtime chief executive has stepped down. You’d have to be naive to think that further organizational change isn’t in the works. Change without understanding, however, makes for change merely for the sake of change. It accomplishes — what? That’s why the time is now for a second investigation: what did all the adults at USA Gymnastics know, when did they know it and what — if anything — did they do about it? Again, this is primarily on USA Gymnastics. She was right about that, and 100 percent. Someone from the USOC should have been there. All the same, this is essentially about USA Gymnastics. Contrary to widespread public belief, the USOC is not involved in the day-to-day management of an individual federation — the jargon is “national governing body” — such as USA Gymnastics. There literally are dozens of NGBs in the U.S. Olympic landscape covering the Summer and Winter Games sports. The system is set up for these NGBs to be as autonomous as possible. The USOC can contribute funding, sometimes significant; in any regard, it maintains a big-picture oversight role. Some observers are now suggesting that the USOC ought to take the step of “decertifying” USA Gymnastics — that is, blow it up and start all over again. Reality: that runs the significant risk of doing far more damage than service. In all likelihood, such a step would leave the entire gymnastics community, and particular the athletes, those in the women’s team and those beyond — the men’s team, the rhythmic gymnasts, the trampoline gymnasts — in bewildering uncertainty, and for an extended length of time. Right now, the USOC would seem far better off doing what it has made a hugely constructive practice of doing over the past several years under the direction of chief executive Scott Blackmun and board chair Larry Probst: working behind the scenes. People should not assume that because the USOC is not theatrically out front, particularly in the media, that it is not doing anything. That simply has not been its way in search of exactly what is called for here: process and necessary reform, including but not limited to policy and legislation. “To know what changes are needed requires us to understand what exactly happened and why it has happened. “This is a painful process, but it’s the only way to identify all the factors that contributed to this problem and how they can be avoided in the future. Newer PostIf you're worked up about the Russians, what about A-Rod?